. Published on October 27, 2017 . The lovely Katherine Heigl recently had her bed made with Cariloha’s luxuriously soft white king Resort Bamboo Sheet Set, two Cariloha Bamboo Pillows, and one of Cariloha’s graphite plush bamboo blankets. In the photo, she’s loving all the softness with her three beautiful children, giving you a glimpse into how soft and comfortable the bamboo bedding really is. 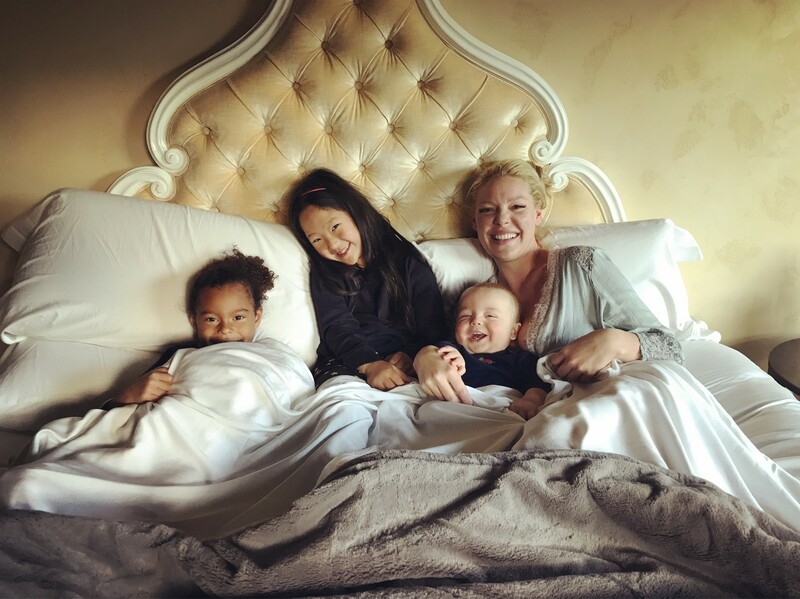 Grey’s Anatomy alum Katherine Heigl posted a photo with her three children — daughters Naleigh, 8, and Adalaide, 5, and 10-month-old Joshua Jr. — via Instagram Monday. In a paid partnership with Cariloha, the Knocked Up actress, 38, is seen smiling with her kids cuddled up in bed together. “Some mornings are meant to be spent staying cozy in bed, especially since I found the most comfortable bedding I’ve ever slept in from @cariloha (my kids are pretty fond of it too!) Their bedding is made from bamboo, so it’s more breathable and soft and I can’t get enough. You’ve gotta try it for yourself. Here’s an exclusive code: ‘KATHERINE20’ for 20% off their website! #BambooNation #Ad,” she captioned the cute image. Earlier this month, the Doubt actress posted a video dancing with her baby boy. Last month, the actress posted a photo of her daughters playing in the snow. The 27 Dresses star recently posted pics of her daughters on their first day of school. Adalaide was off to kindergarten, while Naleigh was starting the third grade. The actress raises her three children with husband, musician Josh Kelley. See more about Katherine at Celebrity Scoop or on Katherine’s Instagram page.